Visit our Resources page to download our Decennial conference proceedings as well as several exploration workshops and videos. This challenge is open to both the exploration industry and academia. Register and gain access to the digital datasets to submit an entry for the award. 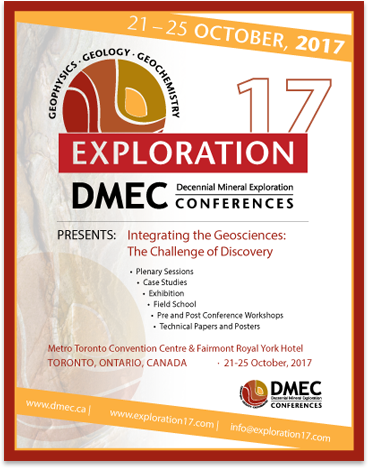 Decennial Minerals Exploration Conferences (DMEC) was created in 2005 as the legal entity responsible for all aspects of the decennial conferences. The previous conferences, starting in 1967, were operated informally but with the impending Exploration 07 conference (September 2007), a formal umbrella organization was required to handle various legal and administrative issues associated with holding a large complex event. The sixth conference was held in October 2017 along similar lines to 2007, with an agenda designed to summarize the advancements in the state of the art in minerals exploration technology over the previous decade through a series of focused technology reviews and case studies in the fields of geophysics, geochemistry, remote sensing and information processing and data management. Following Exploration 07, the DMEC executive undertook to define a more proactive, on-going role for the organization as 10 year gaps in activity by the committee was no longer seen as adequate. Some of the major initiatives include establishing a permanent DMEC web site which serves as a home for the proceedings of all decennial conferences held. In addition, DMEC directors have been encouraging other workshop and conference forums that repeat and enhance the DMEC message of the better integration of technology in exploration. DMEC has had a presence at the annual PDAC conference since 2011, providing a technology-focused workshop inside the overall PDAC conference. Prior to Exploration 07, the decennial conferences had defined themes but were overall did not attempt to undertake any activity other than the building and carrying out of the next conference; once completed the conference organizing committee disbanded. For these events, the mission could be simply defined as creating and running a successful meeting. Post Exploration 07, the executive realized that a clearer statement of purpose was required to define the organization. The main task of DMEC remains in running the decennial conferences (the next one is scheduled for Q4 2027). On a more on-going basis, DMEC’s mission could be defined as promoting the better integration of technology into minerals exploration. This has a number of facets including education, advocacy and actively supporting the visibility for DMEC as a group that contributing to addressing technology-related issues in the exploration business and profession. Interested in helping organize a DMEC event? Please contact one of the DMEC executives.